Italian businessmen played a key role in both international trade and finance from the Middle Ages until the first decades of the seventeenth century. While the peak of their influence within and beyond Europe has been thoroughly examined by historians, the way in which merchants from the Italian peninsula reacted and adapted themselves to the emergence of greater commercial and financial powers is mostly overlooked. This collection, based on a vast variety of primary sources, seeks to explore the persisting presence of Florentine, Genoese and Milanese intermediaries in some key hubs of the Spanish monarchy (such as Seville, Cadiz, Madrid and Naples) as well as in eighteenth-century Lisbon. The resilience of powerless merchant nations from the Italian Peninsula in the face of increasing competition in long distance trade is deconstructed by analyzing the merchants’ relational dimension and the formal institutional resources they found in the host societies. 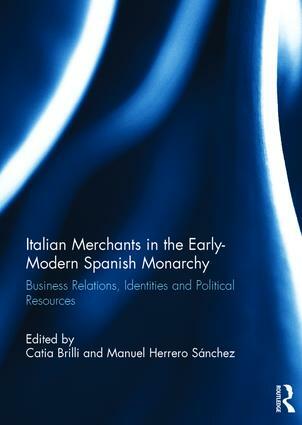 By offering new insights into the mechanisms of circulation of men, goods and capital throughout the Iberian world, this book will contribute to better assess the polycentric nature of the Spanish monarchy and, more in general, the complex system of commercial exchanges in the age of the first globalization. This book was originally published as a special issue of the European Review of History/Revue européenne d’histoire. Catia Brilli is a research fellow at the University of Milan, Italy, and honorary researcher at the University of Seville, Spain. She also works in collaboration with the Bocconi University of Milan. Manuel Herrero Sánchezis Associate Professor of Early Modern History at Pablo de Olavide University in Seville, Spain, and the principal investigator of the research project on the polycentric model of shared sovereignty (sixteenth–eighteenth century) and an alternative route in constructing the modern state.